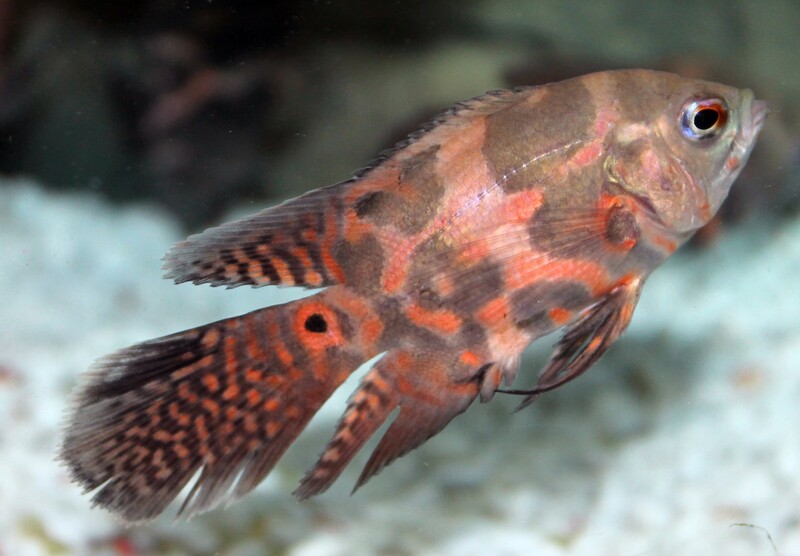 Description- Oscars are a South American cichlid found in the water of the Amazon Basin. In the early 1800's Oscars were given the Latin name Lobotes ocellatus, but this has been updated to Astronotus ocellatus, a hopefully more accurate name. Oscars are fairly large fish, typically reaching lengths between twelve and sixteen inches. These fish generally live for eight to twelve years, depending on the quality of care given. Equipment & Maintenance: To keep an Oscar healthy, remember to provide them with plenty of clean, warm water. Temperature should be about 77° Fahrenheit, and ideally should remain between 74 and 81,° so you need a heater and a thermometer. Keeping Oscars too warm for long periods of time will result in Oxygen deprivation, which can cause nerve damage, heart damage, and can seriously hamper the immune system. Keeping them too cool or exposing them to sudden chill can also hamper their immune system. An impaired immune system makes them more susceptible to many diseases, from easily treatable Ick to more difficult diseases such as hole-in-the-head. Oscars are very messy fish, so tank maintenance is paramount. Perform a monthly water change, so that your Oscar always has clean water and the waste that is not processed by the filter is removed. Your Oscars need good filtration to keep the water from becoming toxic, and you need to keep the filter(s) well maintained. When selecting a filter, remember to make sure that the filter provides excess filtration for a tank with the large capacity that an Oscar requires. Many people use multiple smaller filters to maintain a large tank. Using several smaller filters allows you to stager your filter maintenance so that you are not changing all of your filter media at once and risking cycling your tank again. Remember, it is very important that your filters provide filtration in excess of your total aquarium volume. Food & Care: Oscars are primarily carnivorous (eats meat), so you must provide them with a high protein diet. Many high quality processed fish foods are available on the market today, and most frozen fish foods are also appropriate. In the wild, most Oscars eat primarily small fish, aquatic invertebrates, insects, and insect larvae, only opportunistically scavenging on an old carcass, nipping at the fins or scales of larger fish, or consuming plant matter, so you are best off to try to duplicate this in the aquarium environment. Provide a wide variety of processed, frozen, and freeze dried foods. Oscars should be able to consume all the food you offer within two minutes of feeding. If there is food in the tank after this time has elapsed, this contributes to poor water quality and makes the Oscars more susceptible to diseases. Oscars are less aware than most fish that they are prey animals. However, in order to feel comfortable, they need to have lots of hiding places. Oscars like to rearrange their tanks, so, unless you don't mind the Oscar moving everything around on you, stick with large, heavy pieces that will be harder for the Oscar to get a hold of and move. Remember, you should avoid using sharp or rough decorations that your fish may get hurt on, in case your fish dart into them when startled. Like most other fish, they are more comfortable and will come out more and be more active if you can provide them with 50-75% cover - this means you should make half to three fourths of your tank space hiding places. Providing sufficient cover reduces stress and therefore improves your Oscar's immune system, reducing chance of disease.